The concern of our congregation is especially directed towards youth. Through education, but also through other forms of guidance we want to help them to find their way in the world of tomorrow. (Constitutions I, 30-31). In 2008, the youth movement “Ambassadors of a Worldwide Brotherhood” (Ambassadors WWB) was started by the brothers. The foundation for this was laid in the run-up to the World Youth Days of 2008. The goal of the WWB is to bring together young people who, starting from their own culture, want to engage themselves for the global movement of mercy and brotherhood. Within the WWB, these young people orientate themselves on the spirituality of the congregation. The first activity was an international meeting in Tomohon (Indonesia) with subsequent participation in the World Youth Days (WYD) in Sydney in 2008. The success of this activity was given a follow-up: participation in the WYD in Madrid in 2011, the WYD in Rio 2013, and in 2016 the WYD in Krakow. Meanwhile, the movement has grown into an international group of young people who are also actively working in their own country, in their daily lives and in their desire to work towards a world of mercy and brotherhood. 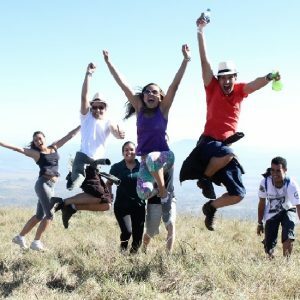 Within the WWB groups of young people are actively involved in seven countries: the Netherlands, Kenya, Namibia, Brazil, Indonesia, Tanzania and Timor Leste. The group of ambassadors WWB in Kenya is a very active group. They have launched several long-term projects, such as an agricultural project, a school program and a water project. They also organize the so-called Christmas Food Drives. The proceeds are, for example, for the orphans of the Asante Children’s Home in Naivasha and for the people in the slums of Kibagare and Kangemi. A group of active ambassadors has also started in Tanzania. 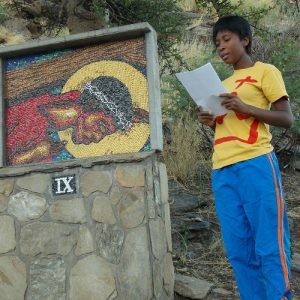 Inspired by their own participation in the World Youth Days, the Ambassadors WWB in Namibia, together with some brothers CMM, initiated the first ‘Catholic Youth Days’ in their own country in 2013. The event became a great way for the Namibian youth to taste a bit of the spirit of the World Youth Days. Ambassador Shadu Mbala: “The ambassadors in Namibia are not afraid to listen to the inspiration of their faith and to act accordingly. In 2009, for example, we organized the first ‘Walk with Christ’, a pilgrimage that has been held each year since.” The ambassadors in Namibia have become pioneers of religious formation and youth activities in their country. In 2009, a youth group, the ‘Grupo Vocational Misericórdia‘ (a vocational group on the theme of mercy), was launched in Brazil. In regional gatherings, youths from Janaúba, Coronel Fabriciano, Joaquim de Bicas and Belo Horizonte come together for reflection and discussion around the central question: “What is your vocation in your life?” In addition, meetings are organized at the central level. From this group, also the participants for WWB joining the World Youth Days are selected. 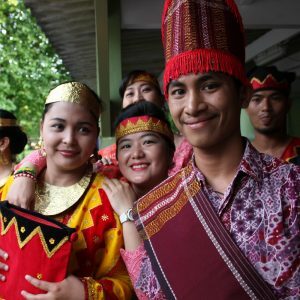 In Indonesia there are several regional WWB groups: in Yogyakarta (Java), Kupang and SoE (West Timor), Tarakan (Kalimantan), and in the diocese of Sibolga (Nias / Sumatra). In addition, there is also an active group of ambassadors in Timor Leste. With their efforts within the parishes, they keep the church young and actively involved. Some examples: In the diocese of Sibolga they organized agricultural activities around ‘Laudato Si’, thereby bringing the importance of this papal encyclical to the attention of the local population. Activities in Tarakan and Kupang took place such as visiting children’s homes and fundraisings. In Timor Leste, the ambassadors are active in parish work, visiting the sick, and providing English language courses for children and youth. 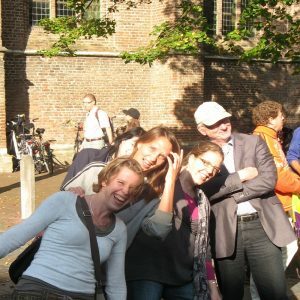 The ambassadors in the Netherlands meet a few times a year to deepen their faith, in the spirit of the Brothers CMM. Also, in their daily lives and work, they try to convey the values of mercy and brotherhood. An example is the mother-child center ‘Bij-1’ in The Hague, set up by one of the ambassadors. Sometimes incidental activities are set up, such as organizing a Christmas meal in a shelter or weeding a monastery garden. 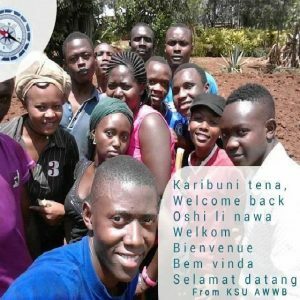 A Dutch ambassador, then a physician in training, worked as a volunteer for OIP’s medical staff (a project from the brothers in Oyugis, Kenya) for three months.